A Letter from erstwhile Kartarpur resident. Comments - My place of birth is Village Doda(Darbar Sahib Kartarpur). I am now an old man of 72 years(Born in 1932). So long I have lived on memories linked with my village, the Mandir and Dharamsal there and the people, who were mostly Mahajans and Brahmans living in our neighbourhood. Those memories still haunt and I have an earnest wish to be able to move about freely in and around Darbar Sahib, where Masya(Amavas-monthly congregation) and fair of Dasvin( Joti-jot Samavan Divas of Guru Nanak Dev Ji)and Vaisakhi were celebrated/organised with great devotion and grandeur. I vividly remember Tayaji Bhai Malang,Sohan Lal and Bhai Gian Chand Sweetmeat sellers in the village and at Darbar Sahib during the Melas referred to above. Taaies Dhan Dai, one a Brahaman and another a Mehri, I miss for the love and affection, which they showered on me and other members of my family, whenever we were there in the village. Taaya Fateh Chand, a Mehra in our neighbourhood and husband of Taai Dhan Dai was a unique personality, full of love and affection. Then Jaasar Junction, in whose vicinity was Mandi Pandori- my Naankey. We lived in Rawalpindi but during second world war and the riots in Pindi in March,1947, I alongwith my mother had to stay in Mandi-Pandori and I attended Khalsa High School, Narowal for my 5th grade and from April,1947 to August,1949 for 10th Class. To Narowal, I went along with my maternal cousin Bhaa Gurbachan Singh, his friend Bhaa Harwant Singh from village Qiampur. We would have a race to reach Narowal or would travel(without ticket) to and fro Narowal, when train or rail car(Dabba) timings suited. Another personality in my mind is that of Bhaa Sadhu Singh, from Village Kakkeke, who would some times join us at Jassar Railway Station to either march on foot to Narowal or board the train.The wonderful booking clerk was Mr. Aziz, who knew that we travelled without ticket, turned away to other side on seeing us students, alighting from the train. I wish to do something for my birthplace and serve Darbar Sahib Kartarpur, before I die. Please pray for me and help me establish contact with any person anywhere in the world having any link withe era and the described area in Pakistan. Please keep me informed about any thing latest related to Darbar Sahib Kartarpur. > je Guru Nanak Sahib. 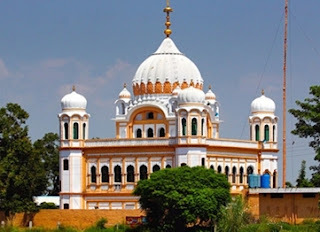 > Narowal or Darbar Sahib Kartarpur.